While growers faced their share of challenges this past season, tender manufacturers had their own issues to contend with, tops being simply keeping up with the demand for their units. To a company, representatives we talked with said it was a huge year and orders are strong for 2013. Manufacturers credited a solid growing season (in spite of the drought) for many regions, higher than expected commodity prices and continued corn acreage expansion for the boom. “Towards the end of the fertilizer season we were as far as three months out on new order deliveries,” says Shawn Hudspeth of Adams Fertilizer Equipment. In normal years Adams is able to build up an average of 30% of expected production during the late summer to begin a new season. But early in the 2012 season, inventory was completely depleted and the company needed to run its entire plant on overtime, with the powder coat paint department going 24 hours a day at peak. Tim Tenhet, sales director with KBH Corp., sees his firm’s “meteoric” gain in market share continuing into 2013 – its growth due in great part to a major revision of features on its 26-ton fertilizer auger trailer tender. Michael Sosebee, sales manager with Chandler Equipment, reports sales of the company’s largest units, rigs with side and rear discharge augers (RDT 24 and SDT MH 24), actually doubled over last year. “There is a need for longer trailers to handle the weight capacities,” says KBH’s Tenhet. In fact, in 2012 the company began offering custom-length trailers to enable customers to maximize legal payloads. Larger product volumes are needed to meet application demands in the field. One option Chandler Equipment added in 2012 was longer auger lengths to accommodate the bigger, taller machines retailers are using, some for a growing of number post-plant fertilizer applications. Moen puts together a number of packages for buyers, such as one that includes a 24-ton Willmar Side Shooter tender, plus a B-B semi trailer (triple axle works best) to mount it on, plus a power pack. FEI even offers an option that can get 32 tons of product to fields. A 16-ton tender is mounted on a truck while another is pulled behind on a trailer. A dealer can drop one unit in a field, say, to service an AGCO floater while the other tender fills another piece of equipment in another location. The first one can simply be picked up later. And the driver doesn’t need a Commercial Driver’s License. Another feature customers continue to ask for is multiple compartments. Adams has seen an increase in sales of three-hopper, truck-mounted tenders, along with multiple bin trailer tenders, such as the Adams 1,200-cubic foot Super Tender. This gain can be traced to the rise in variable rate application and the need to haul multiple products to different locations, says Hudspeth. Doyle Equipment’s 24 FT Trailer Tender has three compartments that can be partitioned to make as many as six if needed. Simonsen is offering dry chemical/micro bins for use with its BFT model tenders. 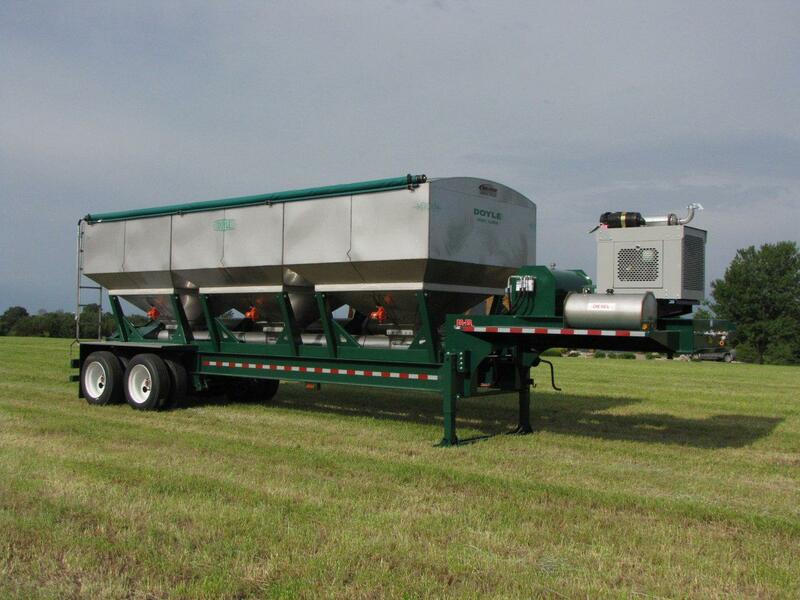 They’re available for either truck or trailer mount and run completely isolated from the fertilizer tender. “They utilize their own closed system to maintain purity of product,” says Owner Jon Simonsen. 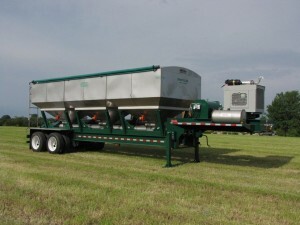 KBH is introducing a new multi-compartment unit this spring geared to meet the growing demands of variable rate and micronutrient applications. In addition to compartments, Bob Eakins, president of Ray-Man Inc., says customers are adding convenience items such as electric roll tarps; plus, he’s seen more buyers using LED lights. New for 2013, Ray-Man is offering a hydraulic manifold, which simplifies the hydraulic system for a wet-kit on semi-tractors. Construction materials, too, are a selling point. Rob Heiden at Doyle Equipment says his company is doing a lot of tender construction utilizing 304 stainless steel rather than 409. The higher grade cuts down on rust — a valuable benefit to customers who don’t like unsightly rust streaks running down the paint on their units. Customers want units that need less maintenance, and stainless steel construction definitely helps, says AGCO’s Dave Lovell, field sales and marketing support manager. All of Willmar’s key tender components utilize it. In addition to demand for its 24-ton flagship tender, Hays L.T.I. is seeing more calls for its transport liquid tankers. Indeed, Ron Lager, sales manager at Precision Tank & Equipment (PT&E), says last season was all his company had hoped for, seeing its “best tank sales ever for stainless steel, mild steel, and fiberglass.” PT&E is adding new equipment at its fiberglass and steel tank facilities to keep up with demand. “We’re seeing dealers and growers considering stainless steel nurse tanks (and fiberglass storage tanks) for their obvious advantages: longevity, safety and less maintenance,” he says. And, he notes, they’re still buying the larger capacity tanks. In general, many manufacturers reported a lot of fertilizer going down in the fall, and Adams’ Hudspeth says the only limiting factor on another outstanding spring season would be the weather. Even with high prices, you have to have moisture to plant, he notes. 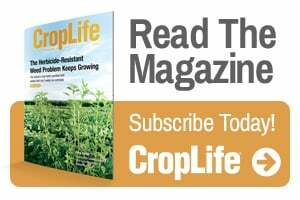 “An early drought could stop planting in areas, which decreases the demand for tendering or any other fertilizer application equipment,” he says.